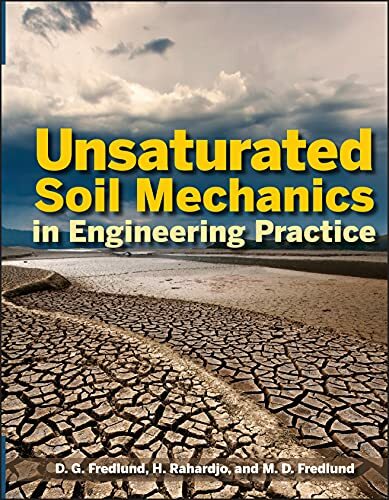 The definitive guide to unsaturated soil from the world's experts on the subject This book builds upon and substantially updates Fredlund and Rahardjo's publication, Soil Mechanics for Unsaturated Soils, the current standard in the field of unsaturated soils. It provides readers with more thorough coverage of the state of the art of unsaturated soil behavior and better reflects the manner in which practical unsaturated soil engineering problems are solved. Retaining the fundamental physics of unsaturated soil behavior presented in the earlier book, this new publication places greater emphasis on the importance of the "soil-water characteristic curve" in solving practical engineering problems, as well as the quantification of thermal and moisture boundary conditions based on the use of weather data. Topics covered include: * Theory to Practice of Unsaturated Soil Mechanics * Nature and Phase Properties of Unsaturated Soil * State Variables for Unsaturated Soils * Measurement and Estimation of State Variables * Soil-Water Characteristic Curves for Unsaturated Soils * Ground Surface Moisture Flux Boundary Conditions * Theory of Water Flow through Unsaturated Soils * Solving Saturated/Unsaturated Water Flow Problems * Air Flow through Unsaturated Soils * Heat Flow Analysis for Unsaturated Soils * Shear Strength of Unsaturated Soils * Shear Strength Applications in Plastic and Limit Equilibrium * Stress-Deformation Analysis for Unsaturated Soils * Solving Stress-Deformation Problems with Unsaturated Soils * Compressibility and Pore Pressure Parameters * Consolidation and Swelling Processes in Unsaturated Soils Unsaturated Soil Mechanics in Engineering Practice is essential reading for geotechnical engineers, civil engineers, and undergraduate- and graduate-level civil engineering students with a focus on soil mechanics. D.G. Fredlund is the author or coauthor of over 460 refereed journal articles, conference proceedings, technical papers, and chapters in edited collections. In 1993, he coauthored Soil Mechanics for Unsaturated Soils, the first major text on unsaturated soil mechanics published. He has served as a research consultant to the Government of Hong Kong, U.S. Army Corps of Engineers, and Saskatchewan Highways, and presently is head of the Golder Unsaturated Soils Group, Canada. H. Rahardjo is head of the Division of Infrastructure Systems and Maritime Studies at the School of Civil and Environmental Engineering at Nanyang Technological University in Singapore. He is the coauthor of Soil Mechanics for Unsaturated Soils and over 200 technical publications. M. D. Fredlund is the President/CEO of SoilVision Systems, Canada, a geotechnical/hydrological software development and numerical modeling company.